Update [21/7/14] - TV One responded at 9am this morning, advising they would get the ad blocked immediately. Nice one - an appropriate and timely response! Incidentally, I got the response via Facebook. The site features video (hosted on YouTube) and a whole bunch of social networking links. You can even follow Kevin on Twitter... I have resisted joining Twitter since February this year, when friends/colleagues first sung its praises, but now I may have a reason to join... Will Kevin update his Twitter himself or is it a new part of his publicist's job description? Despite no official announcement, the Twitter feed proved so popular on the night of the launch that it reportedly crashed the site - read 'Too many Twitters drown out Rudd web site'. Journalist Asher Moses describes Kevin's foray into social media as a 'a high-tech arms race to win the hearts and minds of switched-on Australians'. Today I participated in a Hitwise webinar titled 'Protecting your brand online'. The webinar was conducted on the WebEx virtual meeting platform (which, after logging in, lets you view in real time a presentation delivered by the speakers). As well, participants were asked to dial a toll free number to listen to the audio part of the presentation. It was the second WebEx event I've attended and a great way to attend events from afar (and avoid gobbling up carbon emissions by flying/driving). A session on search engine marketing proved perfect fodder for a webinar. Given that this topic is very complex - and certainly an area well beyond my expertise - I also welcomed the anonymity afforded by this meeting technology. Hitwise describes itself as a search agency. It blends market research tools with technology and, every day, monitors how three million Australian Internet users interact with more than one million web sites, across 165+ industries. The 'Protecting your brand' webinar explored the key words people use to search for content online and which keywords web site owners are using to maximise their "organic" (unpaid) and paid listings on Google. Google was put under the spotlight because this one search engine accounts for 88.5% of all searches. The Hitwise presenters observed how branded search is huge and on the rise, partly because of the increase in navigational searches. That is, searches where an internet user enters a URL (web site address), or part thereof, in the Google search field. I was astounded at the number of people who are doing this and asked Hitwise why they thought it was they case. They attribute it to a growing number of people who are not internet literate, compounded by the introduction of the search toolbars (that usually sit in a prominent position in the browser window, often right next to the location bar). Curiously, they also said some users enter URLs because they are just plain lazy. With more people searching for specific brand names - whether or not it's part of a navigational search or they're just searching for one keyword - some overseas companies are bidding on trademarks belonging to other companies to redirect searchers away from their competitors to their own sites. Of concern, the Hitwise experts say web site owners can lose up to 50% of their traffic if they're not in #1 position. The really mercenary marketers are even bidding on misspellings of trademarks to drive traffic away from competitors. Therefore, the presenters stressed, it is critical for trademark owners to consider all permutations of their brands when bidding for keywords, including misspellings (for example, "Quantas" instead of "Qantas") and keyboard errors (say, typing 7 instead of &). The webinar was partly prompted by the fact that Google has introduced a new policy in North America by which it disclaims any responsibility to monitor or restrict keywords for ads served within the US and Canada. Fortunately, here in Australia, a trademark owner can still submit a "Trademark Exclusion" for Adwords by completing a trademark complaint form. But it's not just trademarks that drive traffic away from the site for which users are searching and over to competitor sites. Generic terms can do just as deadly a job. 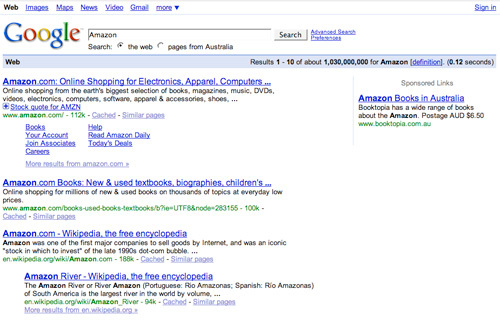 For example, Hitwise data shows that Booktopia bids on keywords Australians are using to find Amazon, resulting in significant "leakage" (or redirection of traffic), as the screenshot below reveals. Presumably they get away with doing this because Amazon does not have an Australian site and has not registered the trademark here.